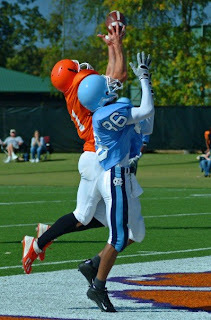 The boys in orange pulled out a tough win over a physical Tarheel team on October 28th, winning 39-15. The passing attack, led by quarterback Scott Anderson, and the running attack led by Tom McCarthy and Branden Burroughs were clicking on all cylinders. 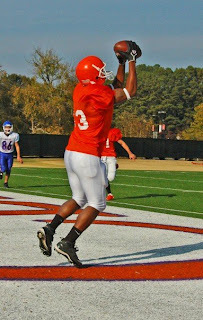 The win gave Clemson home field advantage for the SCCFA championship game this Sunday against UNC. The South Alabama game was canceled due to several scheduling conflicts and in observance of the six students from USC and the Clemson student that died in a beach house fire the previous Sunday. Jonathan Wilson makes a stellar catch for a touchdown. On November 11th, the Tigers pulled above .500 with a solid win over an athletic Georgia State squad, winning 58 – 16. The Tigers came out a little slow, but once the defense set the tone with three picks including one for a touchdown as well as a fumble recovery for a touchdown, the game was sealed. Good luck to Georgia State in the remainder of their schedule. Oh, and remember to wish head coach Patrick Sapp a happy birthday when you see him.